Hello. My name is Brilliance because I am a so incredibly, brilliantly beautiful. I have striking blue eyes and incredible gray and white markings. 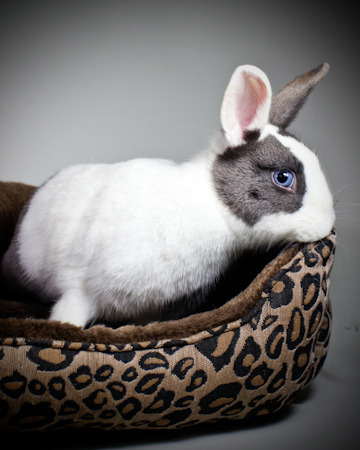 I'm a spayed girl who was part of a rescue of nine rabbits abandoned in the night drop box at Oakland Animal Services. We were left in very bad shape. All my life I have been a very skittish bunny who needed a super gentle and patient human. Someone who saw me as the bright fairy spirit that I am. Marcy and I understand each other and we enjoy spending quiet, meditative time together. I am now a senior bun and I spend a lot of time in Marcy's office. I enjoy scaring off the dopey cats and being made the Queen bunny of the house.